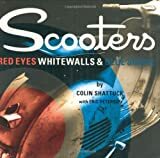 It’s titled “Scooters – Red Eyes, Whitewalls and Blue Smoke” and its has lots of great photographs of Portlanders and of a certain local merchandiser by the name of Modified. It’s fun to play “find the Modified gear in this photo”! You have room enough in your life for one more scooter book. Oh yes you do. This entry was posted in Books and tagged book, lambretta, Red Eyes, scooters, vespa, Whitewalls and Blue Smoke by Tracy. Bookmark the permalink.